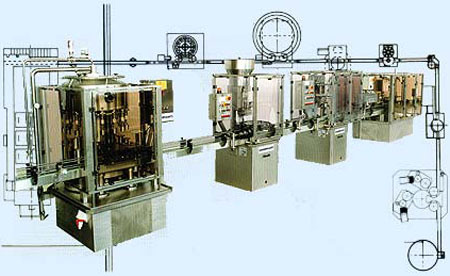 KRONIMPIANTI GROUP has specialized in the realization of small and medium complete bottling, packaging and packing lines. Bottling plants for wine, sparkling wine, beer, mineral water, fruit juices, oil and in the end chemical products as well as liquids and semi-liquids into glass, PET, PE, PVC bottles represent the commercial sectors on which our experience has consolidated. Our plants can reach an output from 1,000 to 10,000 bottles/hour according to the type of container and product to be bottled.